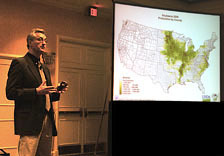 Nearly 150 participants experienced the unique, highly focused 2009 National Soybean Rust Symposium in New Orleans, Louisiana. The event updated a mix of researchers, growers, and consultants on what happened, what was discovered, and what is coming next in the study of Asian soybean rust. In addition to networking, participants listened to 27 presentations and viewed more than 30 posters covering the many aspects of Phakopsora pachyrhizi. A special thanks to all presenters, sponsors, and technical committee members who helped make this program possible. Organizing Committee Representatives from academia, government and industry were involved in the development of the symposium. Program Download a PDF copy of the original program of the symposium. Presentations PowerPoint presentations for each of the speakers are provided here in PDF format. Poster Presentations Abstracts and PDF files of the posters are included in this section. Growers, consultants, researchers and industry representatives listen as symposium organizer Anne Dorrance describes the challenges, collaborations, and successes in the area of Asian soybean rust. Attendees take a moment to talk in between poster viewings. More than 30 posters were on display during the networking events. Symposium organizer Anne Dorrance speaks with Ed Ready about the day's events during a Bananas Foster dessert reception. Ed Sikora gives a lively talk about the integration of foliar fungicides into soybean rust management programs. 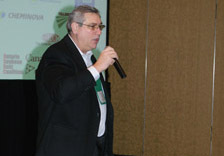 David Wright, Technical Committee Chair, moderates a session on the major achievements in soybean rust research. Ed Sikora and Tom Isakeit discuss a presentation during a coffee break. Friends and colleagues share stories as they dine on a Creole-style lunch.